Marine turtle population numbers have been decreasing. The cause of this is very hard to determine (or study) exactly because they are so long lived (perhaps to 100 or more years) and do not start reproducing until they are quite old (15 to 50 years). Some are accidentally caught in nets, others are caught for food or products (tortoiseshell jewelry), some are killed by man's pollution, and many die of natural causes (predation, starvation, natural disasters). Habitat destruction is another problem - females returning to their nesting beach may find a new maga-resort instead of sand. Detailed studies of each species will help our understanding of how we might aid their population recovery. Recovery efforts now used include hatcheries, protective laws, and rehabilitation programs. 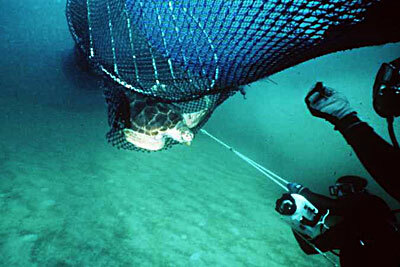 TED - turtle exclusion device - allowing marine turtle to escape a fisherman's net. (NOAA image). Marine turtles have been a wasted bycatch in some fishing operations. 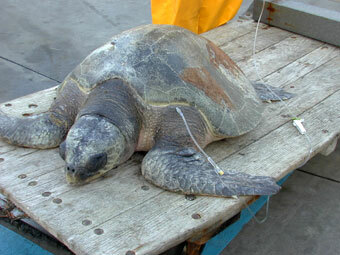 Marine turtles are air breathers and once they are caught in fishing nets they usually are drowned. They are then discarded by the fishermen (often shrimp fishermen using trawl nets). Recently a number of TEDs (Turtle Excluder Devices) have been devised and added to certain fishing nets. These TEDs allow trapped turtles to escape before they drown. Marine turtles and their eggs have been used for food and aphrodisiacs for centuries. Turtle soup has been a staple in many tropical cultures. 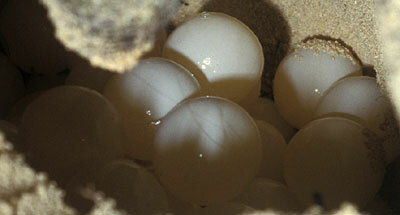 The harvesting of turtle eggs for food is another activity that many tropical cultures have relied upon for protein. The use in several Asian cultures of marine turtle eggs as aphrodisiacs has brought high prices for the robbing of the turtle nests on the beaches. Although most countries outlaw this activity now and protect their marine turtles there are still poachers. Marine turtle products contribute to the population problems of marine turtles. 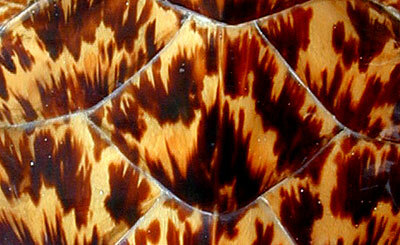 Hawksbill turtles are prized for their shell that makes fine jewelry, eye glasses, and other ornaments. Turtle skin is used to make shoes, belts, and purses. Pollution may harm many turtles especially floating plastics in the ocean. Many marine turtles eat floating plastics from the ocean. The plastic does not digest inside their bodies and may form ulcers in their stomachs. Styrofoam cups are especially noted for this. Plastic bags that are ingested are often found in the gut of dead marine turtles who wash up on the beach. The plastic bags lodge in their digestive tract and block it so that the turtle starves to death. The number of nesting females can be counted by a simple aerial picture. 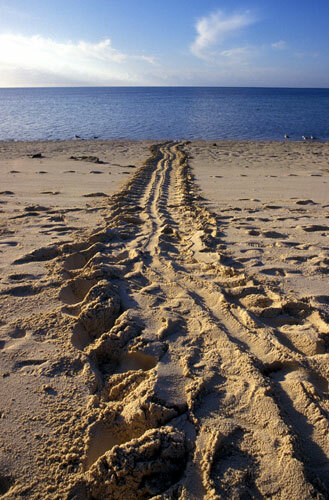 Each female will leave a set of tracks up the beach and then down the beach if she nests. In many areas where there is a large area to survey for turtle nesting a small airplane is deployed each morning to photograph the nesting beaches. The number of tracks can be counted, divided by two and a rough number of nesting females can be determined with a small amount of effort. Studies of turtle nesting beaches gives a general idea of the populations well-being and is used to help draft protective laws. Classified as endangered or threatened in the USA, six species of marine turtles, and their products, are outlawed for import. The hawksbill, Kemp's ridley, and leatherback turtle are listed as endangered by the Endangered Species Act (1973) in the United States. 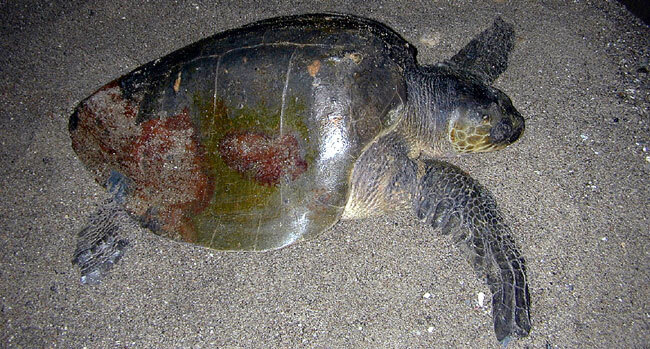 The green, and olive ridley turtle are classified as endangered/threatened. The loggerhead turtle is classified as threatened. 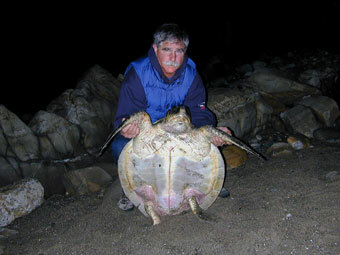 The flatback turtle is never found in the USA so it has no classification. Critical habitats are designated for the green, hawksbill and leatherback turtle. Hatcheries and rehabilitation centers try to increase marine turtle numbers in many countries. Some of these are doing well and others are not. It is hard to know how well hatcheries are doing because it takes so many years for the adult turtles to reappear (at the reproductive sites). Their first fifteen years are still pretty much a mystery so hatcheries have a very long wait to see if any of their babies return. 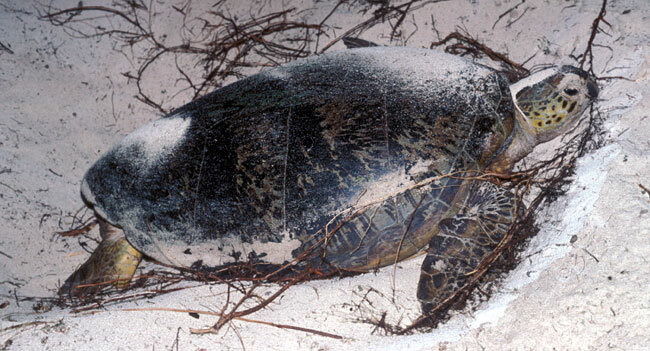 In the USA only Florida has any significant numbers of marine turtles. It is in Florida that a lot of research has been successful and their Universities remain at the forefront of marine turtle research. 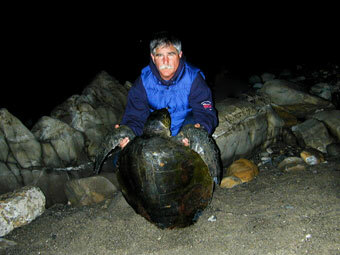 In California marine turtles are rare. When they do occur here they are usually off-course or it is a warm oceanic event. 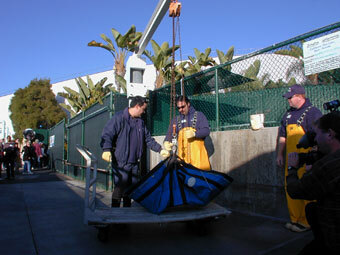 California participates in a rehabilitation program with Sea World in San Diego. 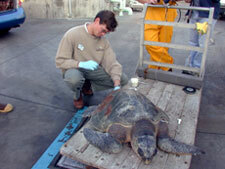 Several marine turtles have been recovered from beaches in California in very bad health. 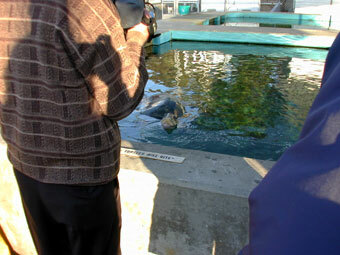 These animals are most often brought to Sea World where veterinarians can care for the animals. Sea World, San Diego also has warmer ocean water than most of California so it is more comfortable for the turtles. 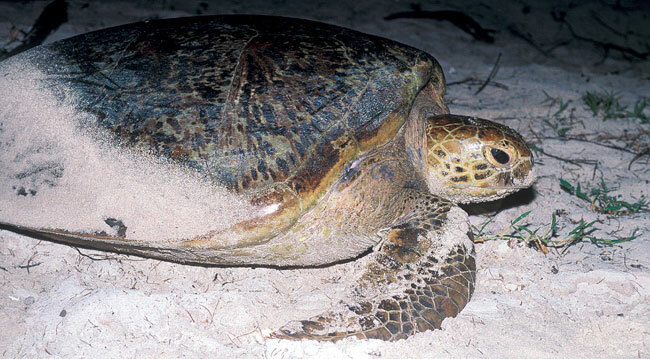 Most often the recovered turtles are suffering from the cold and malnutrition. 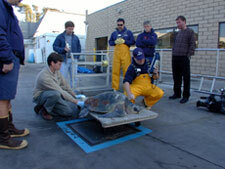 An olive ridley turtle stranded in Santa Barbara in December of 2002. This olive ridley was lethargic and kept coming ashore on the sandy beach in Santa Barbara. 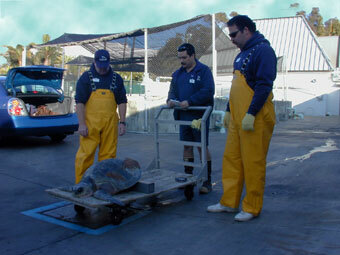 After permission was granted by the Federal authorities in Los Angeles, the turtle was recovered from the beach and transported to Sea World, San Diego. 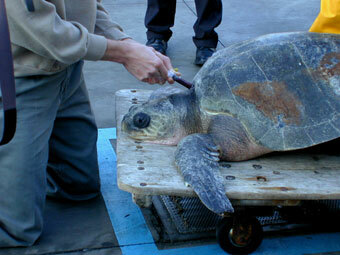 A female olive ridley turtle stranded in Santa Barbara, California on December 23, 2002. She refused to stay in the ocean and continued to come ashore and sit on the beach. Passing beach walkers reported her to the Santa Barbara Harbor Patrol and the local Marine Mammal Rehabilitation Center. The stranded turtle was photographed and measured. It was evening and illegal to move the turtle from the beach without federal permission. During the evening contact was made with a member of the National Marine Fisheries Service (federal agency with authority to authorize taking of marine turtles) in Los Angeles. 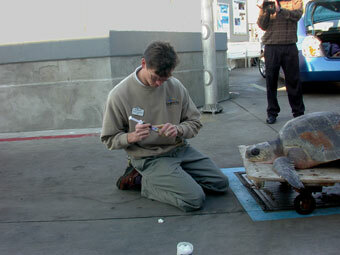 Arrangements were made for the turtle to be rehabilitated at Sea World, San Diego. 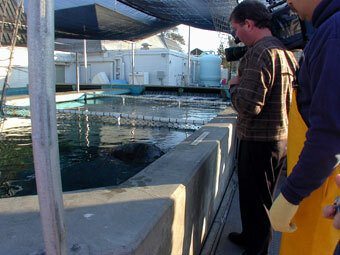 Early in the morning volunteers from the Santa Barbara Marine Mammal Center arrived and the turtle was transported to a salt water pool at the University of California at Santa Barbara. It was Christmas Eve day. The day after Christmas my husband and I drove the turtle to San Diego (a four hour trip). She rested comfortably in the back of our car and rarely moved. 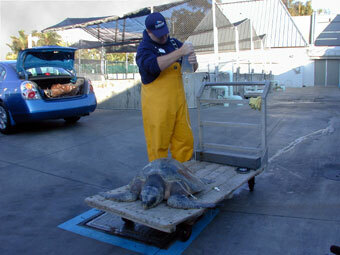 The aquarists at Sea World met us and immediately weighed the stranded olive ridley turtle. She was propped up so that blood would collect in her neck vessels to make a blood test easier for the veterinarian. Sea World's videographer documented her arrival and immediate care. Blood tests showed the stranded turtle was dehydrated and underfed but without any other serious problems. 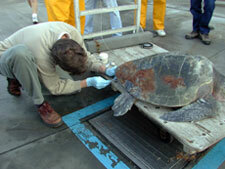 The vet suspected that the turtle had gotten off-course, become cold and lethargic and stopped feeding. Turtles become buoyant when they are not well-fed and cannot dive to get their food. The vet thought that the turtle would probably have died if it had not been recovered and moved to warm water. Without funds to fly the turtle back to the tropics Sea World would treat the turtle, keep it in a warmed tank and let it go during the summer. The ocean in San Diego in summer is quite warm and the turtle would probably migrate south to warmer water if it was healthy. Fluids were immediately given to the stranded turtle to counteract its dehydration. As she lay in the sun receiving fluids the stranded turtle started to show some life instead of being so lethargic as she had been for the last several days. The temperature of the stranded turtle showed that it was hypothermic. The abnormally cold temperature of the turtle was not a surprise to the vet as the turtle had been in the ocean water that was colder than it was used to. 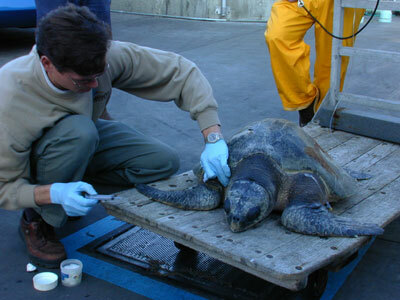 A shot of antibiotics was administered to the stranded turtle to guard against possible diseases that the turtle might contract from its 'chilling' experience. The stranded turtle was put in a pool of warm ocean water where it immediately began swimming around and exploring its new surroundings. The turtle began feeding on its own in a few days and made a remarkable recovery. Hopefully she will return to Mexico and Central America where olive ridley turtles are known to nest. We had hoped for a happy ending for this off-course olive ridley turtle however in the 9 June, 2005 edition of the Santa Barbara NewsPress (the local newspaper in Santa Barbara) Morgran Green reported that this 72-pound turtle developed emphysema and died in 2004 while in captivity (according to Mike Shaw, Sea World curator of fishes). The NewsPress article was reporting on the discovery of several Ridley turtle nests on Santa Cruz Island (just off the coast of Santa Barbara). This is very unusual for a Ridley turtle to be nesting so far north in these cold waters. Scientists are protecting the nests and will monitor them to see if any of the babies hatch. So far no one has actually seen the Ridley turtle, just the nests.